First of all, I’m sorry if it comes as a shock to you that your SLPs might be holding back a bit. Go ahead and take a minute to let it sink in. I’ll wait. Now then, about those things. Even if you have a super-duper amazing relationship with your staff, it’s important that you recognize that there are elements of the supervisor-staff power dynamic that make it nearly impossible for true, open, honest communication to always take place. Here’s the good news: Just acknowledging that fact makes you a better school administrator. So, in the spirit of equalizing that power differential a bit, I asked a group of colleagues the question, “What would you tell your admin if there was no threat of getting in trouble?” Here is what they said . . . Working with other grown-ups is the hardest part of our job. Paperwork? Hard. Kids? Hard. Grown-ups? The hardest. When we finally reach the point where we talk to you about our struggles getting into a classroom to work with a student or our passive-aggressive team member, it would feel really good if we knew we could count on you to help us problem solve. There are some things that we know could be done better. We’d love to feel like we can approach you on one of these things (say, like, how caseloads are assigned) and have a solutions-based conversation about it. We’ll happily acknowledge that we don’t have all of the information that you do, and you’ll happily acknowledge that you don’t have all of the information we do. We’ll share information back and forth and, presto change-o! Wrong things shall be unwronged and all will be right with the world. We need some new materials and to learn some new skills. We go without most of the trainings and materials we’d like to have for kids because we know money is tight and the latest and greatest usually isn’t an option. Not that we’re not grateful for the things that the district decides to buy without our input, or the trainings they decide we must go to, but, as the people in the trenches with students, we humbly argue that we know what we need better than you do. Help us understand the budget and give us control where you can. You might be surprised how far we can stretch a dollar! We know your job is the literal worst sometimes. You walk a delicate tight rope with the unique and unenviable job of trying to simultaneously make your boss, your staff, the parents, and the students happy. You’re stuck in the middle. While it undoubtedly has its many perks, we can also see that it’s a really, really hard job. We’re sorry and we’d love to know what we can do to help. This was one SLPs response when I asked her what she’d like to tell her admin. I think it sums things up quite nicely. Compliance is important. We get it. Prioritizing paperwork over service delivery to kids, though? Not cool, not ok, and not legal. And, on a related note, there is truly shady stuff happening all of the time. You should know that, from compliance to service delivery and everywhere in between, there are things that are happening every day that would make your head spin. And give any special ed attorney a coronary. Do you ever think about the culture of our team? Is it one of fear or one of trust? Is it one of despair or one of hope? Is it one of suspicion or mutual respect? This whole us against you thing is no good. Individually, we can do good things for kids. Together, though, we can do great things for kids. Not so bad, right? Maybe not even anything new for you, but important to consider nonetheless. You want to be better. I know you do. You care about kids and you care about your staff. The big take away here? 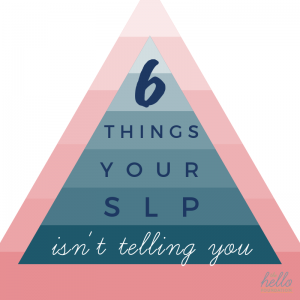 Your SLPs care about kids and they care about you.